You are browsing the archive for Antiquity À-la-carte. 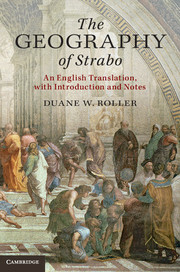 Duane W. Roller’s remarkable new English translation of Strabo’s Geography is now available from Cambridge University Press ( ISBN: 9781107038257; e-book ISBN: 9781139950374). To accompany it, the Center has produced a seamless, interactive online map which is accessible free: http://awmc.unc.edu/awmc/applications/strabo. The map is built on the Antiquity À-la-carte interface, and has immense coverage because it plots all the locatable geographical and cultural features mentioned in the 17 books of this fundamentally important Greek source – over 3,000 of them, stretching from Ireland to the Ganges delta and deep into north Africa. In the e-version of the translation, the gazetteer offers embedded hyperlinks to each toponym’s stable URI within the digital module, making it possible to move directly between Strabo’s text and its cartographic realization. Among the projects undertaken by the Center during this very active year two major preoccupations stand out. One was the initiative to release a series of publicly accessible map tiles suitable for use in almost any web mapping application or Geographic Information Systems (GIS) software suite (http://awmc.unc.edu/wordpress/tiles/). This ambitious goal was achieved early in 2014. 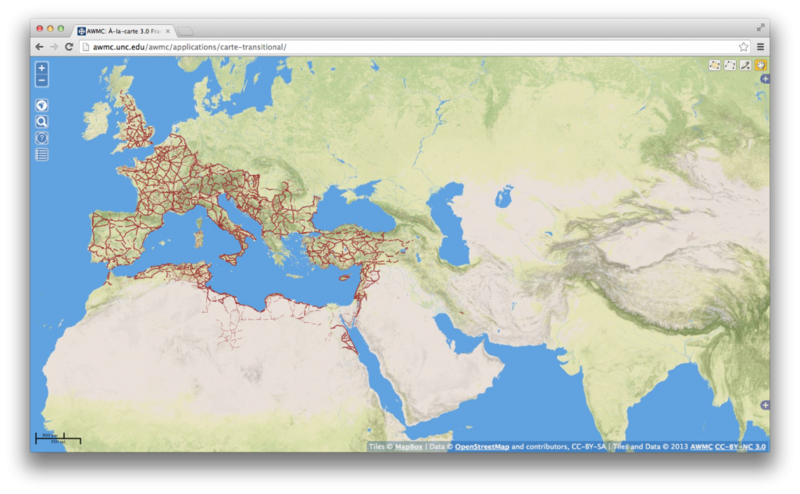 Created from data produced by the Center and generously hosted on Mapbox servers courtesy of the Institute for the Study of the Ancient World at New York University, these map tiles are the first (and, currently, only) geographically accurate base map of the ancient world from Britain to Bactria. The tiles conform to the broad periodization (Archaic, Classical, Hellenistic, Roman, Late Antique) presented in the Barrington Atlas. Inland water, rivers, shorelines and other geographical features are returned so far as possible to their ancient appearance. The neutral presentation enables scholars to represent the physical environment of nearly any ancient society within the vast arc of space spanned. Also early in 2014 the Center released revised tiles of the Roman road network. 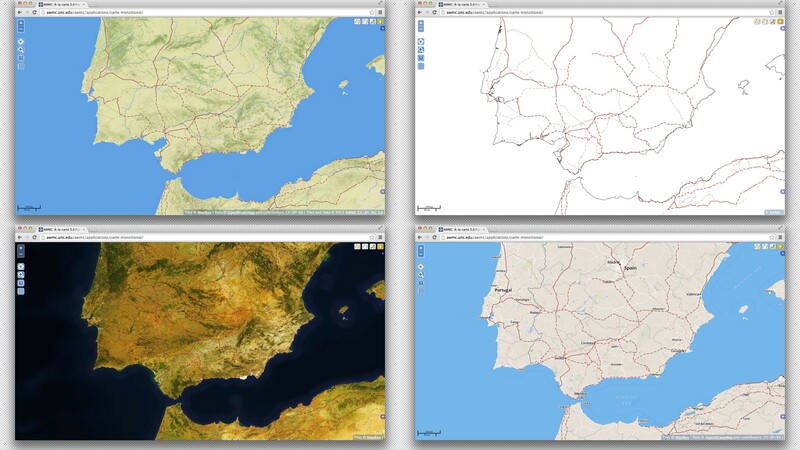 All these new map tiles were rapidly adopted by the Pleiades Project (see below) for its web interface, and by the beta version of Stanford University’s ORBIS Project 2.0 (http://orbis.stanford.edu/v2/index.html). The new tiles are in turn the building blocks for the Center’s beta version of Antiquity À-la-carte 3.0 in preparation (http://awmc.unc.edu/awmc/applications/carte-transitional/). It should fully replace the current and still-active version 2.0 by the end of next academic year. Like version 2.0, it is a versatile web-based GIS interface and interactive digital atlas of the ancient Mediterranean world, offering data produced by the Center as well as the entire feature set of its longterm ongoing partner the Pleiades Project (http://pleaides.stoa.org). As with 2.0, users can frame, populate and export maps according to their own design, either selecting the Center’s data or adding their own content, including line work and shading. In accordance with the Center’s standard operating procedure, all this content is released under the Creative Commons Attribution-NonCommercial 3.0 Unported (CC BY-NC 3.0) license, permitting free use for non-commercial purposes. The Center’s other major preoccupation was completion of a seamless, interactive online map to accompany the remarkable new translation into English of Strabo’s massive Geography by Duane W. Roller (The Ohio State University) due for publication in both print and electronic formats by Cambridge University Press in summer 2014. The map itself is accessible free: http://awmc.unc.edu/awmc/applications/strabo. The map is built on the Antiquity À-la-carte interface, and has immense coverage because it plots all the locatable geographical and cultural features mentioned in the 17 books of this fundamentally important Greek source – over 3,000 of them, stretching from Ireland to the Ganges delta and deep into north Africa. In the e-version of the translation, the gazetteer offers embedded hyperlinks to each toponym’s stable URI within the digital module, making it possible to move directly between Strabo’s text and its cartographic realization. While production of this map inevitably presented the Center with technical obstacles, its success in overcoming them has assisted other mapmaking initiatives. The opportunity for the Center to incorporate the enormous body of Strabo’s geographic information into its API (http://awmc.unc.edu/api) has also been invaluable. The Center’s wallmap of Asia Minor in the Roman imperial period at 1:750,000 scale (measuring 4 x 6.5 ft) is a longterm project that has presented even more challenges than the Strabo map. Fortunately, it has at last been brought very close to completion this year. Richard Talbert exhibited a near-final draft in Ankara, Turkey, at the conference Pathways of Communication: Roads and Routes in Anatolia from Prehistory to Seljuk Times, where it was so favorably received that the British Institute requested permission to keep it on display. The Center has begun work on a similar map of the Iberian Peninsula at the same scale. Mapmaking commissions fulfilled by the Center included two maps for Clifford Ando (University of Chicago) to illustrate his research on the Romans’ pacification of North Africa; one plan of Augustan Rome, three plans of Rome and Constantinople in the fourth century AD, and one overview map of the Mediterranean for the forthcoming monograph Sacred Founders (University of California Press) by Diliana Angelova (University of California, Berkeley); one map of the Sasanian Empire in the third century AD for a Brill monograph by Iain Gardner (University of Sydney); and six maps of Eurasia, the Roman empire, Roman North Africa, the barbarian kingdoms, the Iranian world, and central Asia in the fifth century AD for The Cambridge Companion to the Age of Attila edited by Michael Maas (Rice University). The Center supplied all 28 maps for the second edition of Mary Boatwright and co-authors, A Brief History of the Romans (Oxford University Press). 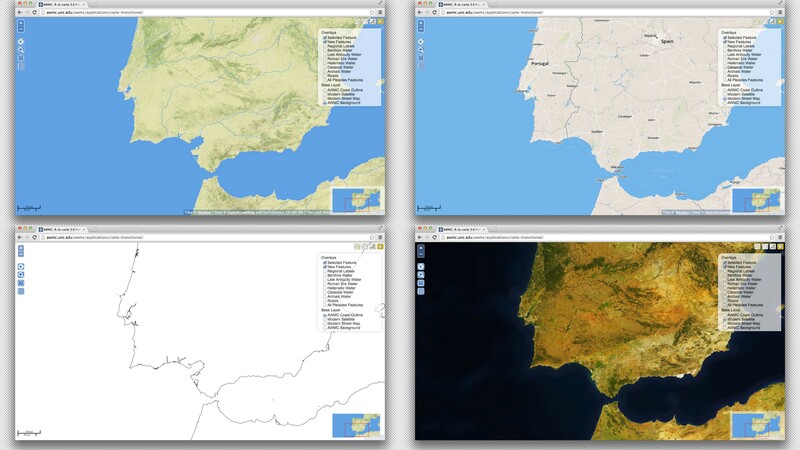 In addition, the Center provided an integration of its current map tiles and shapefiles of the Iberian Peninsula, as well as its Peutinger Map files, for the Fall 2013 exhibition at the Institute for the Study of the Ancient World, New York University, Measuring and Mapping Space: Geographic Knowledge in Greco-Roman Antiquity. The Center also assisted Princeton University Press in the test stages of its innovative re-issue of the Barrington Atlas as an app for iPad 2.0+. Richard Talbert gave a lecture at the ISAW exhibition, and a keynote address on mapping Asia Minor at the Ankara conference Pathways of Communication. At the Chicago annual meeting of the Archaeological Institute of America, Steve Burges (now a graduate student at Boston University) presented a paper “The creation of the Forum Romanum: Three-dimensional mapping and Rome’s flood-prone valley,” incorporating research he had done at the Center for his UNC senior honors thesis last year. In Chapel Hill, Ross Twele, Ryan Horne and Michael Heubel were chosen to make a presentation at the Historical GIS Student Showcase in April. The Center also made a poster presentation on Antiquity À-la-carte and its Strabo map for University Research Day. As hoped, several students who had been working most productively at the Center returned to continue this year. Ryan Horne again played a major role by taking the lead in the release of all the new map tiles, in the ongoing work on Antiquity À-la-carte 3.0, and in solving the difficulties of presentation faced by the Strabo and Asia Minor maps. Ray Belanger further expanded the Center’s geodatabase of physical and cultural features derived from the Barrington Atlas. 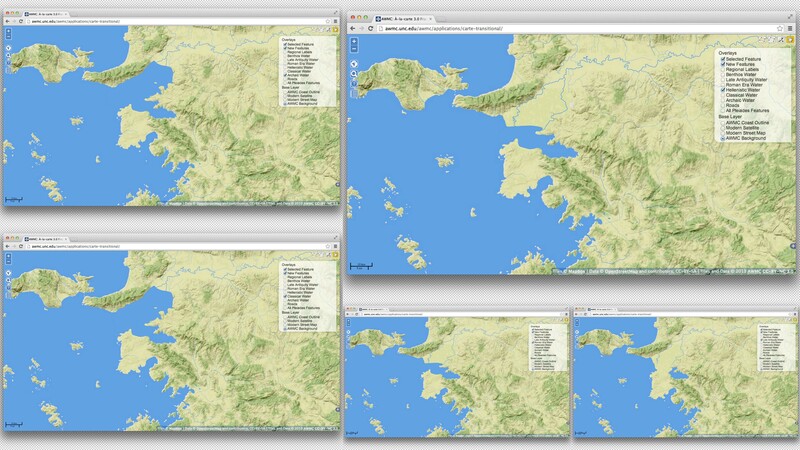 Luke Hagemann incorporated Greek place names into the database and cross-referenced Strabo’s toponyms with Pleiades IDs. Two undergraduate students and one graduate (Lindsay Holman) were recruited: Audrey Jo revised the Center’s shoreline geodatabase especially in regions where marked change has occurred since antiquity. Michael Heubel created a new geodatabase of polyline extents and labels for regions, peoples, tribes and physical features. Lindsay expanded the geodatabase of rivers courses, in particular to classify them at distinct zoom levels for online viewing. Audrey, Luke and Ray all graduated, and their loss will be keenly felt, as will that of this year’s exemplary acting director Ross Twele. He has been tireless, creative, diplomatic, and enviably clear-headed in advancing an array of demanding projects and responsibilities each at a different stage and with its own distinctive needs. Ross will be succeeded by Ryan Horne. This afternoon, the Ancient World Mapping Center is participating in The University of North Carolina‘s annual University Research Day. The Center will be displaying a poster collage of our latest research and programming, especially in regard to Antiquity A-la-carte 3.0. The poster features with special prominence an image of our forthcoming Strabo Online web application in connection with Duane Roller’s new translation of the Geographika for Cambridge University Press. It also displays images of A-la-carte’s capability to map man-made features according to the Pleiades database and the AWMC’s collection of shapefiles, to represent coastal variations both within periods of ancient history and in contrast to the modern topographical aspect, and to map surviving ancient features at tenths-of-a-second accuracy with the use of handheld GPS devices. A PDF file of the poster (licensed under a Creative Commons CC BY License) can be seen here. The option of saving data sets assembled using the application and that of uploading data to the map (.json). Options for both printing and exporting the map created using the application; combining the export functionality with the ‘numbered features’ option provides an ideal template for a map-based quiz or examination. Version 2.0 makes extensive use of linked data opportunities by connecting to the Pleiades Project and participating in the linked data initiatives of the Pelagios Project. For Pleiades community editors and members, editing of Pleaides can happen directly by means of this interactive feature of the application. Version 2.0 offers an updated visual interface and site layout. Version 2.0 allows other websites to communicate directly with the application using .json objects or text parameters in the url. Version 2.0 allows the user to create a range of line work, polygons, and shading that then appear in the exported version. These are but a few of the new features offered by Antiquity à la Carte 2.0. We encourage feedback from members of the community who use the application – your comments will help AWMC improve the application. Users can also become registered members of this site and thus be able to closely follow the discussion and receive word of further updates. AWMC is especially grateful to the invaluable assistance provided by our colleague Joe Ryan of UNC ITS Research Computing. Work continues on AWMC’s “Antiquity à la carte” application, with an enriched, high-resolution terrain layer and increased functionality available under ‘Map Tools’. We are eager for community feedback as users explore the application. AWMC unveiled the demo version of its new “à la carte mapping” program this past weekend at the 2012 meetings of CAMWS in Baton Rouge, Lousiana. Engineered by Ryan Horne, a Ph.D. student in Ancient History at UNC and a cartographic research assistant at AWMC, the “Antiquity à la carte” application allows the user to design and populate maps of the ancient world. The phase one version, available here, focuses on the Greek world; the full version, when rolled out, will cover the entire Mediterranean basin. AWMC is grateful to UNC ITS for supporting this project, and in particular our colleague Joe Ryan, Humanities Research Associate at UNC.